New pedal offers modulation modes. Walrus Audio has announced the Slö Multi Texture Reverb. The new pedal offers three different algorithms “specifically designed to invoke textures for bringing dreams from your subconscious to reality,” according to the company. The Slö has three modes for shaping new sounds: Dark (Blendable Lower Octave), Rise (Ambient Swell) and Dream (Latching Pad). Secondary functions on the toggle switch allow the user to change between different modulated wave shapes like Sine, Warp and Sink. Modulation can be further manipulated by holding down the bypass switch and adjusting the depth knob to control modulation speed. 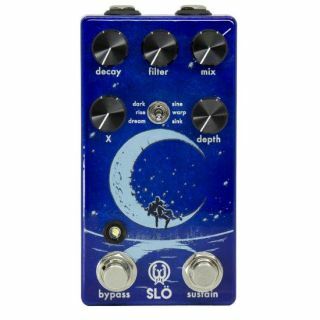 The Slö comes in a “Lollipop Blue” enclosure with artwork by Christi Du Toit. Power requirements are 9VDC, center negative. The Slö is available for $199. For more information or to purchase, head over to Walrus Audio.